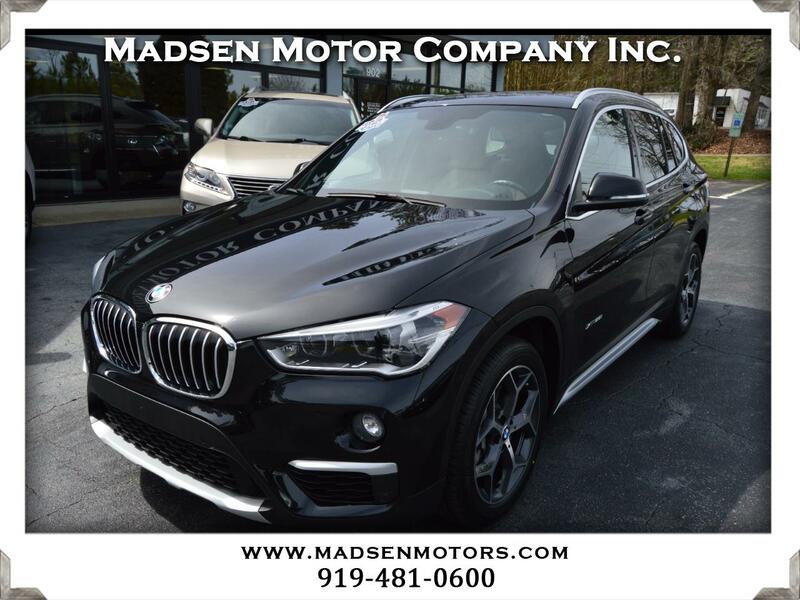 Used 2016 BMW X1 xDrive28i for Sale in Raleigh, Durham, Cary NC 27511 Madsen Motor Company Inc. Check out this beautiful, low-mileage 2016 BMW X1 xDrive28i with only 27k miles! This exceptional car is Black Sapphire Metallic with Oyster Dakota Leather and is loaded with over $6,000 in factory options including Driver Assistance Package (Rear View Camera, Park Distance Control, Parking Assistant), Premium Package (Power-Folding Mirrors, Universal Garage Door Opener, Comfort Access Keyless Entry, Panoramic Moonroof, Auto-Dimming Mirrors, Auto-Dimming Rearview Mirror, Lumbar Support, Ambient Lighting, LED Headlights w/Cornering, Satellite Radio), STEPTRONIC Auto, Transmission, 18" Y- Spoke Alloy Wheels, Roof Rails in Satin Aluminum, Matte Chrome Exterior Trim, Alarm System, Power Tailgate, Black High-Glass Trim, Power Front Seats, Automatic Climate Control, M Sport Suspension, and much more. This car also comes with a clean 1-owner CARFAX history and the balance of the BMW New Car Warranty until March 26, 2020 or 50,000 miles whichever comes first. Buy with confidence from Madsen Motor Company - voted ''Best Pre-Owned Car Store'' 4 years in a row in the Best of Cary awards!